I Ran My First Marathon. Now what?!? I don't want to be James "Buster" Douglas. For those of you unfamiliar, Buster Douglas was the first man to beat "Iron" Mike Tyson in a boxing match. This was back in February of 1990. Up until that time, it was thought that Tyson was unbeatable. Douglas was a 43-1 underdog but did the unbelievable and knocked out Tyson. Later that year he fought Evander Holyfield and lost the title. After losing the title, he lived off his millions and got fat. He retired for six years and briefly returned to the sport. Most people haven't heard much of him since 1990. Now, believe me, I know I didn't win the Heavyweight boxing championship. But I did do something fairly remarkable. I went from being a morbidly obese human being weighing over 400 pounds to finishing a Marathon. 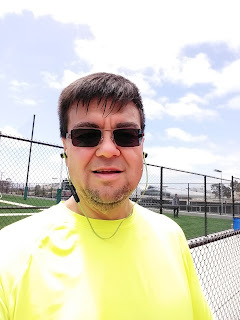 I finished the San Luis Obispo Marathon on April 29, 2018. Pretty good if I do say so myself. In the process, especially over the past few months, I've gained a bit of notoriety. I've been interviewed on a few Podcasts, been featured in the newspaper. And became a bit of a celebrity. Virtually everyone has something nice to say about my accomplishments. I'm very appreciative of all the nice words and try to convey that in my responses. I know that I'm in my "15 minutes" so to speak. I'll never run another "first" Marathon. What I don't want is for this to be the pinnicle of my running career. I'd like it to be the start of my Marathon career. I don't want to be remembered as "the guy who used to weigh 400lbs that ran a Marathon". Over the next few decades I'd like to be referred to as "the guy who weighed 400lbs that KEEPS RUNNING Marathons". I've grown to love being active and exercising. I embrace all forms of movement. There are things I haven't gotten into yet, but who knows? But I love the running. I can put on my sneakers and just go. No fancy equipment needed. So... I ran my first Marathon, now what? Well, I have a 5k scheduled for Memorial day week-end. And a Half-Marathon in July. And a couple more 5k's in August and September. And the City-To-The-Sea Half in October which I hope to break two hours. And then a 20-miler in November. And the California International Marathon in Sacramento on December 2. I hope to break five hours in my second Marathon. I think those races will keep me busy. Let's keep RUNNING! In November of 2016 I started running regularly. When I say "regularly", I mean in my daily walks I'd run a few hundred yards or maybe a mile at a time. I didn't want to overdo things. I had weighed over 400lbs just a few years earlier. After having bariatric surgery in 2015 I was now in the low 200's. Everything had gone really well but I found the weight creeping back on a bit after a bout with shingles. As the days passed I ran more and more. Then in late December I decided to try and run a 5k without stopping or walking. I did it! It took me over 37 minutes but I did it. Shortly thereafter I signed up for my first 5k race. It was on February 20, 2017 in Ventura. A rainy day but I was determined to do it. I crossed the finish line in 34:51 and collected my first MEDAL. The next month on my birthday I ran another one. And in April I ran the 5k during SLO Marathon week-end. I was so excited and confident that I could progress with this whole running thing that I signed up for the SLO Marathon in 2018. Over the following year I increased my running and entered more races. Multiple 5ks and 10ks. A couple of Half-Marathons and even a 20-miler. When the calendar turned to 2018 I developed a training plan and focused on the Marathon. All my races up until then became "B" races. I wanted to be prepared as possible for the BIG one. I had a few setbacks during training (like most do). Twisting my ankle in February and catching a cold in March. But I knew overall I was doing fine. As race day approached my anticipation grew. To go from being morbidly obese to a Marathon finisher? I never even thought of such a thing much less dreamed it. 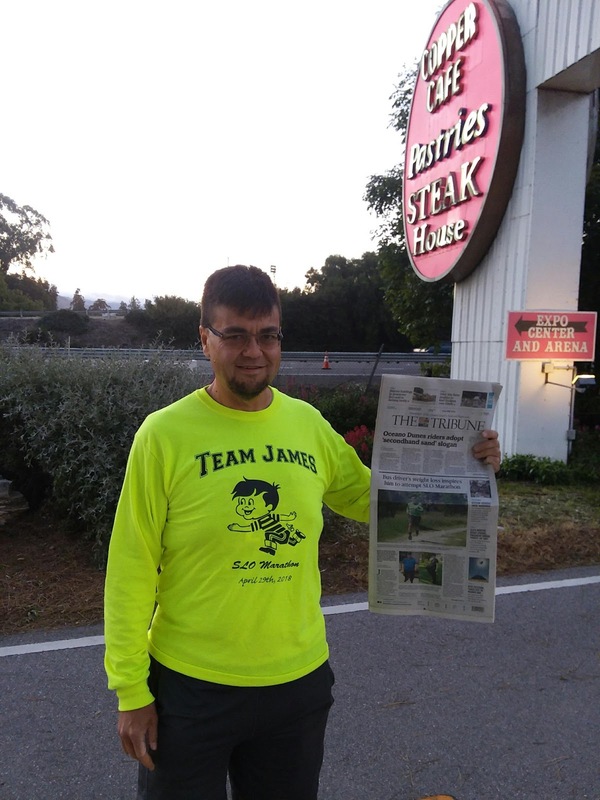 Seventeen days before the race the SLO Tribune interviewed me. My girlfriend ordered shirts with "Team James" emblazoned on the front. People at work started asking me more and more about it. The support and encouragement I received was really phenomenal. I woke up at 4am on race morning. I only got about five hours sleep. We headed to Denny's for my pre-race breakfast. It worked for me in March so I thought I'd try it again. One of my Supervisors got up early and drove to the start so he could wish me well and say a little prayer for me. I told myself I was going to take it slow and now worry about time. I just wanted to enjoy the experience and soak it all up. My strategy worked. I enjoyed every second of my journey. The crowds were great. The volunteers were awesome. And the race organization was top notch. In all honesty, it couldn't have gone any better. Multiple friends and co-workers came out to root me on as I traversed the 26.2 miles. I stopped and took selfies with them all. A couple of guys even ran with me a few miles. And my girlfriend Annette who has been my #1 supporter was there the whole time. At the start, on the course and the finish. We took a bunch of pics and then had some wings to celebrate! My final time was 5 hours, 24 minutes, 19 seconds. Not that it mattered. I had just completed a MARATHON. To Weigh or Not to Weigh, THAT is the Question! Native San Diegan living the good life on California's Central Coast. Getting fit and staying happy.